We provide free and independent advice and help for overseas students looking to study in the United Kingdom. Dedicated Support for International Students of all ages. 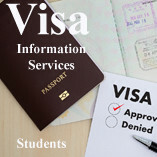 A Full and independent Visa Advice service.